This book was terrific in so many ways. Though it is part of a series, it stands alone while giving you glimpses of previous characters lives and carrying on their story. But, it’s also like a blending of families. There were so many reasons Hope and J.T. shouldn’t date. There were so many reasons it shouldn’t work. Yet, it did fantastically. In the background, and occasionally in the foreground, is a stalker that no one can figure out who it is. While this definitely added to the tension and drama, it was only a side bar and not a major influence on loving the characters and their issues. Hope and J.T. are superb characters that are strong in who they are. The neighborhood, their work lives and their friends and family all come alive. I absolutely loved this story. Hope’s mother keeps pushing her to find the right man, find a better job with more potential, and so much more. Hope knows her mother loves her but she is tired of never living up to her expectations. Finally, she decides to rebel and bring home a “bad boy”. That is if she can get J.T. to play along. J.T. has dreamed of Holly since he saw her at his sister’s wedding. He agrees to participating in this fake relationship but he plans on making it a bit more than fake. Can he get Holly past play acting and into making this relationship real? What do you do when a "fake" relationship is so much better than the real thing? Hope Donnigan is finlly getting her life together. She's working a job she likes, has some amazing friends, and is steering clear of Mr. Wrong. Now if only she could get her mother to understand that. Maybe a hot tattoo artist from the other side town is just the ticket to teach her mom a lesson. "A must read." 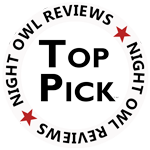 —Night Owl Romance Top Pick!